Time for some real talk. There?s been something gnawing at me on social media lately, and no, I?m not talking about politics. According to your Facebook, Instagram, and Tweets, I must be the only person on earth?who?has not been to Hawaii. And quite possibly, I may be the only person who?isn?t there right now. It seems like every day, someone new is saying Aloha and showing their feet in the sand. I’m a little jealous, folks! How is this possible? I can?t be alone, right? Please tell me it?s not just me! And if you say it’s because I spend all my time and money at Disney, shut yo mouth! (That’s mostly aimed at Mr. S who sometimes reads my blog and makes those comments). A Hawaiian vacation is as American as The Brady Bunch and Scooby Doo. Heck, even the kids from Saved By the Bell made it to Hawaii. And, yet, I’ve never been. Which means my kids have never been either. Does that mean I’m a failure as a mom? Ha! Probably not, but I think this is one of those vacation spots that shouldn’t be overlooked. I have major FOMO going on right now- fear of missing out- which is surprising since Hawaii hasn?t been high on my travel list, mainly due to the time in the air it takes to get there. I?ll be honest: a seven-hour flight with kids just doesn?t sound appealing to me. But then I see pictures like this, and I think, yeah, I could manage seven hours on a plane. I know I?m not the only one who hasn?t been, despite what my Facebook feed feels like. And with some of the best times for Hawaiian travel coming up during the Christmas holidays and Spring Break, I felt I should investigate the options. You know,?FOR THE KIDS! Since these are also some of the most popular times to visit, booking lodging really can’t wait. Especially when you add in the Moana factor. In a few weeks, this movie is going to be in theaters, and I predict a rush to book that first Hawaiian vacation for many families. Do not underestimate the power of a Disney movie, right, Norway? So which is the best Hawaiian island for a first-time family? 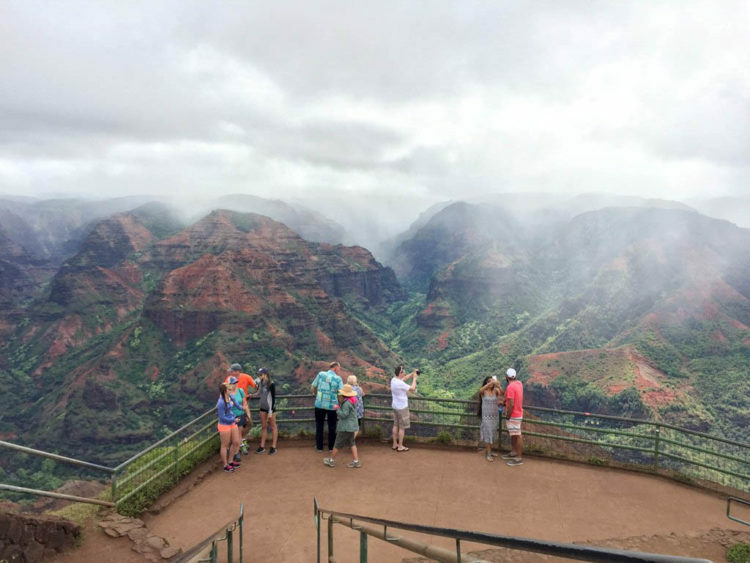 Each Hawaiian island has a different vibe, tourist highlights, and stunning geography. To give a few examples: Oahu is the most populous island and is home to North Shore and Diamond Head. The Big Island of Hawaii offers active volcanoes Mauna Loa and K?lauea. Maui has fantastic beaches, with picture perfect sunsets. And Kauai is breathtaking with excellent hiking trails. In short: you have options. Lots of options! I?m not sure there is a wrong choice, but you still have to narrow it down. Here are my top four choices. To start, check out Oahu. If you are arriving by air, you are likely to fly into Honolulu Airport on Oahu as it?s often the least expensive option. And that?s one thing you will quickly learn: getting to Hawaii isn?t cheap! All major airlines fly into here from the mainland, and many international airlines are serviced here as well. One draw of Oahu is the USS Arizona and Pearl Harbor. For my family, this would be a must see. Not only are we former military, but my grandfather joined the Navy soon after December 7, 1941. Plus, I?ve always wanted to see the waves at the North Shore and mayyyybbe spot Steve McGarrett, aka Alex O’Loughlin, and the Hawaii 5-0 crew filming, preferably wearing their bathing suits. Even if we don?t stay on this island, we will be sure to visit. Because: Steve. Mc. Garrett. With 11 of the 13 climate zones located on one island, the Big Island is certainly unique! There’s so much to do and see here that you can find something to satisfy everyone. This island boasts the largest mountain in the world Mauna Loa (by volume) and the tallest mountain in the world, Mauna Kea. Yes, it’s bigger than Everest when it is measured from its base on the sea floor to its peak. Plus: active volcanoes. That’s not something you see every day! And truthfully, the draw of seeing lava flowing from active volcano sites appeals to my ?look kids, learn something!? side. Maui has a bit of everything with touristy sights balanced with good beaches and hikes. It is usually recommended for a first trip- and it?s certainly less touristy than Honolulu over on Oahu. During the Christmas to Spring Break season, you can see whales during migration season from the beaches. Now that would be cool for my Arizona kids to witness. Some advice I?ve been given is to book activities ahead of time such as the Old Lahaina Luau, zip lining, snorkeling, and driving the Road to Hana. And you can bet we won?t forget the shave ice! Kauai is a favorite because it is the least touched island. Friends report Kauai as having the most ?Hawaiian feeling? of all the islands. It offers an authentic atmosphere with guava plantations, a lighthouse, and waterfalls to explore. The large waterfall scene in Jurassic Park (the original) was filmed on Kauai; you can visit the falls. Since we are (still) living in that dinosaurs-are-coolest-things-ever phase, I know the family would geek a bit visiting here. Hiking and seeing so much green (oh my word- so much green!) would be a top priority for us on Kauai. Whichever island you choose, the right place to rest your head at night will set the tone for the trip. We’ve narrowed down our choice and are looking at booking in Maui for our first stay. Yes, I know you expected to hear Aulani, and it’s a very close second. But I think for the first trip it will be Maui and we will look at a condo. We like to have some room for our big family to spread out with some comforts of home like a washer and dryer. And I love having a full fridge for all those Mommy-beverages I will consume while on vacation. Frothy drinks with fresh pineapple and maybe an umbrella sound pretty Hawaiian to me! It’s over 14 hours to get from Boston to Hawaii so seven sounds like an easy trip to me! And you gain all those extra hours for sleeping with the time zone change. This is true. You do gain some time going in that direction!